Join me in Shipshewana, IN for a weekend of stitching, laughing, eating, and general shenanigans with 39 other like-minded people. YG's retreat has evolved to become a relaxing weekend away from our everyday life, involving as much or as little stitching as you would like, but always including many laughs, many opportunities to squish beautiful yarn, and great company (oh, and the food. So delicious!). The cost of $350 includes your room, shared with a friend; breakfast on Saturday and Sunday plus dinner on Saturday night; AND a swag bag, filled with your project for the weekend. More details will be posted here in the coming weeks, but for now, save the weekend of October 25th in your calendar, and set an alarm for Monday, April 8th at 8:00pm. Sign ups will be available at that time, right back here. I look forward to spending the weekend with you and 39 more of my closest stitching friends! Total cost for the weekend is $350. The deposit of $100 guarantees your spot! 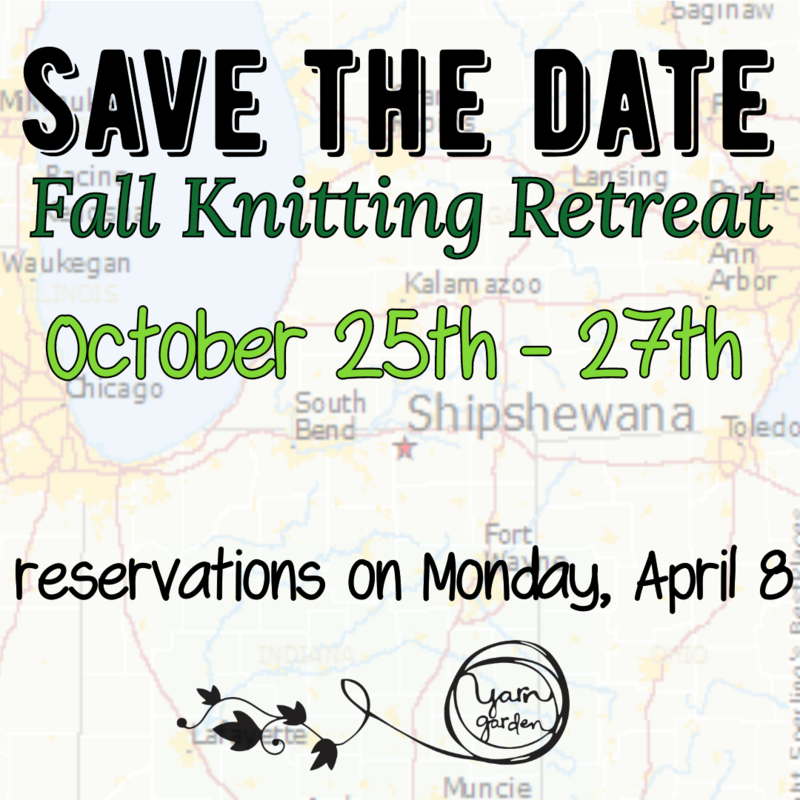 If you attempt to register and are unable to, please email me ASAP at yarngardenmi@gmail.com to be put on the waiting list (waiting list will be first come, first served). Please register for only ONE spot.